Car makers are desperately trying to solve the conundrum of packing enough energy into an electric vehicle, but with bigger batteries comes more weight. Writing here Ulrik Grape, CEO of NAWA Technologies, a French start-up believes hybrid batteries are the answer, capable of slashing pack weight by almost a third and improving performance. There’s no doubt we’ve seen some dramatic improvements in automotive battery systems in the last decade, but what if you could combine two different types of technology, giving the best mix of energy storage and power? That is the theory behind the hybrid battery system, a combination of Lithium-ion and ultracapacitors that could dramatically slash pack weight and boost overall efficiency while improving the system’s lifetime. 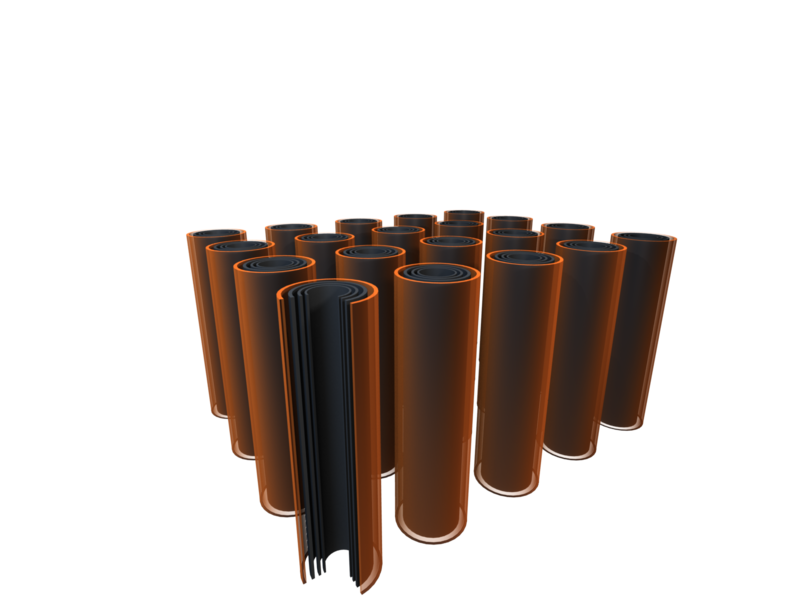 Here at NAWA Technologies, we have a new form of ultracapacitor that is based on a combination of vertically-aligned carbon nanotubes with a unique coating. These ultracapacitors are capable of charging within seconds (and doing so over one million cycles) and can offer between three and five times the power and energy capability of current ultracapacitors available on the market. We call it the Ultra-Fast Carbon Battery, and it bridges the gap between existing ultracapacitors and Lithium-ion cells. However, ultracapacitors – even the best ones on the market – still can’t compete with Lithium-ion batteries on energy storage. In theory, one could power a small car with ultracapacitors but its range would be very short and it would require frequent charging. In an urban environment or used as a shared car this would be perfect but for the broader automotive industry, the full potential of our technology would be unlocked by a hybrid battery system. Firstly, we must understand how energy is recovered and used within an electric car. Everyone has experienced that a car can brake more rapidly than it accelerates. The available power that can be recouped during braking is more essential than that which is needed to accelerate. The reason is that today most of the energy associated with braking is lost as the existing systems cannot recoup it. Only around 20-30% of the energy is recouped by a standard Lithium-ion battery during regenerative braking as a result of its chemistry, meaning it cannot accept the high charge rate without severely jeopardising safety or its lifetime. Contrast that with our ultracapacitors which can recover around 90% of that energy because of their ability to charge and discharge in seconds without losing performance. This ability means they are very good at processing heavy loads like regenerative braking and harnessing energy – much better than traditional Lithium-ion batteries. Furthermore, they are very good at discharging energy quickly, which makes them ideal for giving rapid bursts of acceleration. Again, they do this far better than a Lithium-ion battery can. When you combine the two, you can reduce the size of the Lithium-ion battery due to the ultracapacitor removing some of the former’s workload. This results in less overall weight, more efficiency and better throttle response. In the long term, as a result of being able to charge an ultracapacitor more than a million times – and because it is taking the heavy charging loads – it is possible to make the Lithium-ion battery’s life much easier, limiting it to just the gentle loads such as regular charging and discharging. This would then result in the life of both the Lithium-ion battery, and the whole energy system, being prolonged with a safer operating mode. Fundamentally, this results in total costs being lowered over the lifetime of the system. To get a true idea of the benefits of the ultracapacitor, we must quantify it. When we discuss a hybrid system being far more efficient, by how much could we slash the weight of the battery pack? Well, we conducted some digital simulations on one of the world’s most advanced automotive batteries: the motorsport battery used in Formula E, which is a highly sophisticated Lithium-ion system. Our tests led us to discover that by combining our ultracapacitors with this battery system, we could reduce the overall weight from 300kg (Lithium-ion only) to 210kg (200kg of Lithium-ion plus only 10kg of NAWACap), with the same overall power output, by making the Lithium-ion battery smaller and reducing the complexity of the energy and thermal management system. That equates to a 30% reduction in weight, but with an increase in performance and range as a result of the overall pack weight being much lower. It is not only performance and weight that is improved, though, as due to the ultracapacitors’ ability to be recharged up to a million times, battery life also increased. Talk to any automotive engineer and they would no doubt be delighted at the thought of saving nearly 100kg on any part of the vehicle’s architecture too. It is certainly foreseeable that this hybrid battery system can be translated to road cars, most likely on a high-end supercar to begin with, but it wouldn’t take too long before this technology could meet the wider market. We believe that you could see such a hybrid battery system arriving in vehicles within the next four to five years. In fact, the benefits of this battery system would be best seen when the car is doing a lot of braking and accelerating and driving at moderate speeds – such as within urban areas, where 80-90% of an internal combustions engine car’s usage occurs today. In this context, we made simulations for other cars. As an example, NAWA is leading a project called Eurostart DRAGON – with the participation of the Swiss company Almatech and the Spanish Company Magtel – in which we have found that a basic vehicle such as a Renault Twizy could reduce its battery size by 50% and double its range by combining just 15% of our ultracapacitors in the overall system. Simulations have been conducted based on both real usage and the standardised new WLTP test representative of urban cycles. One of the major question marks regarding Lithium-ion batteries is their reliance on rare earth metals, but our batteries are based on an abundant, accessible and natural material such as a carbon. A hybrid battery system would reduce the size of the batteries, reduce the use of raw materials and reduce the need for waste treatment – it really could be the best of both worlds. Future energy storage doesn’t stop there, though. Because we can also sandwich our batteries between other materials, including carbon fibre and metals, we can use the same building blocks to design a completely new energy storage system: the structural battery. Cars are prime candidates for this. Integrating energy storage into the chassis or the body of a car (or the wings of a lightweight plane or the hull of a high-performance boat) opens up new possibilities. In our initial simulations, a multi-stacked carbon structural battery cell, located in the chassis of a small, light EV, could give up to 15km of range (in addition to that supplied by the onboard batteries) and be recharged in just three minutes. Combine that with a hybrid battery system and you can really start to see how energy storage is about to change.